ESSEX, CT – JANUARY 14, 2019 – Leading the prominent 2019 Northeast winter boat show schedule, the Hartford Boat Show (HBS50) will open at the new Earth Expo Center at Mohegan Sun in Uncasville, Connecticut, Thursday January 17 and run through Sunday, January 20, showcasing every aspect of Boating Under the Sun on Connecticut’s lakes, rivers and the sound, just in time for boaters to start thinking about the upcoming season. Produced by the Connecticut Marine Trades Association (CMTA) and powered by Evinrude/BRP, the event is celebrating its 50th anniversary and will feature over 125 exhibitors covering all available space at the new Earth Expo Center at Mohegan Sun; in the center’s ballroom, breakout rooms, and casino; with over 400 boats and water craft being featured. Over 35 dealers, representing at least 95 different brands of boats, motors and trailers are participating, and over 23 new exhibitors have joined the show this year. Additional sponsors include Helly Hanson, Renewal by Andersen, and the Connecticut Port Authority. Opening Ceremonies are scheduled for 11:15 am on Thursday, January 17, just prior to HBS50 opening at 12:00 pm. Show sponsors, state and local dignitaries, members of Mohegan Sun Leadership and others are expected to participate. The Ceremony will commemorate the 50th anniversary as well as celebrate the new partnership of CMTA’s Boat Show and Mohegan Sun. According to the CMTA, early January is the most advantageous time for placing new boat and equipment orders. “Since this is the first boat show in 2019 on the east coast, it’s really the best timing for purchasing, with many dealers offering season and show promotions, and delivery timing to meet the opening of the boating season in the state,” said Kathleen Burns, Executive Director, CMTA. “With the reduction of state sales tax on boats, motors and trailers that went into effect last year, the show’s timing, and our new location, coupled with the sheer size of the show, we are anticipating robust attendance,” she continued. The Hartford Boat Show exhibitor list reflects every element of recreational boating in the state, for those enjoying Connecticut’s waterways from the sound to the lake and rivers, as well as experienced navigators, to new boaters. HBS50 visitors can expect to see boats, jet skis, personal watercraft, paddle sports, kayaks, marinas, motors, slip rentals, servicing, fishing gear, educational programs and materials, insurance, trailers, electronics, sanitation, air conditioning, attire, nautical home décor, decking, dock building, winter storage, financing, an shore side activities such as destinations and attractions. Boasting over 618 miles of tidal shoreline, 180 lakes and over 5,800 miles of rivers, recreational boating in Connecticut is far more than just fun on water – it’s business that is vital to the Connecticut economy, employing over 7,300 people and engaging nearly 100,000 people who register boats in the state each year. Over 82% of the Hartford Boat Show’s exhibitors are Connecticut based companies, representing the vast scope of recreational boating in the state. Connecticut businesses from all regions of the state are participating, with the inland regions represented from Candlewood to Columbia, the shoreline from Noank to Norwalk and the Connecticut River Valley from Saybrook to Portland. A special Boating in Connecticut Workforce area will highlight career opportunities in recreational boating, open positions, and CMTA Foundation workforce initiatives and scholarship programs. Welcome to Our Waters is a new interactive learning center which will feature an ongoing series of open sessions on boat maintenance and boat safety. New boaters will find a dedicated section offering helpful tips for those just embarking in the sport. With separate registration, boaters can take a boat safety class Friday, January 18 or Saturday, January 19 and leave the show with their boating license. The Windows to the Future section, sponsored by Renewal by Andersen, returns to the show as a demonstration arena featuring schools and boat building and educational programs from across the state. For family fun, Connecticut’s Department of Energy & Environment (DEEP) will give show visitors the show will have the opportunity to try on and pose in a variety of life jackets in front of a marine setting on a green screen, and be photographed, demonstrating how “Boating is Serious Fun at Mohegan Sun.” There will be interactive activities in the new Kids Cove, and kids of all ages can compete against the entertaining Captain Greg Dubrule at the ever popular Blackhawk Fishing Charters Fighting Chair Challenge. Among some of the exciting door prizes that will be available throughout the show, are a new kayak from Black Hall Outfitters, a Raymarine Dragon Fly GPS/Fish Finder from Dockside Electronics and a stunning lighted and framed nautical chart from Harbour Lights Nautical Charts. With expanded hours this year, HBS50 will be open Thursday, January 17 from 12:00 pm to 9:00 pm; Friday, January 18 from 12:00 pm to 9:00 pm; Saturday, January 19 from 10:00 am to 9:00 pm and Sunday, January 20 from 10:00 am to 5:00 pm. “HBS50 is indoors ‘under the sun,’ so everyone will be comfortable taking advantage of all the show has to offer,” Burns said. Tickets for the Hartford Boat Show may be purchased at www.hartfordboatshow.com. Pre-show online tickets are $12. 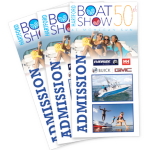 During The Boat Show, general admission is $14, with children under 12 accompanied by an adult admitted free. A Two Day Pass allowing access to the show any two days is available at $20. A Senior/Military one-day pass is $10. Group sales for groups over 15 people may be arranged by contacting CMTA Show Staff at 860-767-2645.